Apollo 11 astronauts Neil Armstrong and Buzz Aldrin were the first people to walk on the moon. After more than ​21 1⁄2 hours on the lunar surface, in addition to the scientific instruments, they left behind an Apollo 1 mission patch and a memorial bag containing a gold replica of an olive branch as a traditional symbol of peace and a silicon message disk. by NASA between 1967 and 1973. 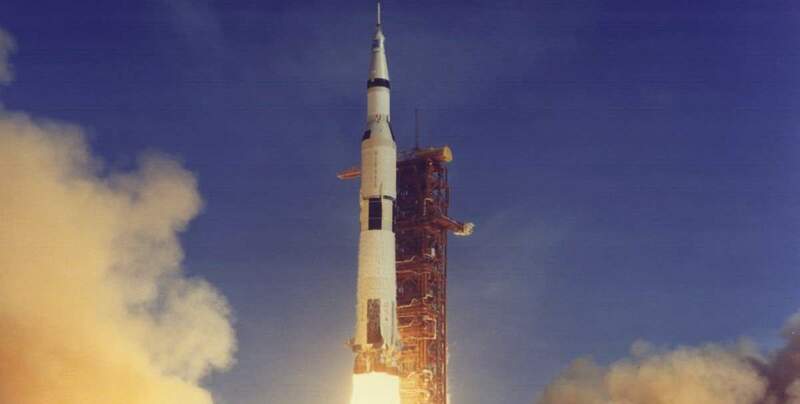 Saturn V was developed to support the Apollo program for the Moon landing and was later used to launch Skylab. A spokesperson from Nvidia, the American technology company specialized in manufacturing high-performance graphics processing units (GPUs), debunks the conspiracy theories about the moon landing. The tech giant uses the latest technology to recreate some of the iconic photos which taken during the moon landing digitally and to debunk conspiracy theories around them. On September 17, 1962, Neil Armstrong’s parents, Stephen Koenig Armstrong and Viola Louise Engel Armstrong joined “I’ve Got a Secret”, a panel game show produced by Mark Goodson and Bill Todman for CBS television. They had a “secret” that their son just became an astronaut for NASA on that day, one of the nine newly chosen men for the future space missions. Mr. and Mrs. Armstrong whispers the Host Garry Moore’s ears their secret: “Our Son became an astronaut today”. On July 20, 1969, at 20:17 UTC, two American astronauts, Apollo 11 mission commander Neil Armstrong and pilot Buzz Aldrin landed the lunar module Eagle on the Moon. It was the first time humans set foot on another planetary body than Earth, making the moon landing probably the most monumental event in history. Vox.com published a beautiful video highlighting the key moments of the Apollo 11 mission. NASA has just published Two Years’ Worth of Apollo 11 Mission Audio (the first manned moon landing mission) on their website “Explore Apollo“. That’s more than 19,000 hours of audio. So now anyone can hear the endless hours of conversations between the Apollo 11 astronauts and Houston. Some recordings are really exciting, for example, the audio of the lunar module landing. When the lunar module enters the lunar orbit some interesting, tensed and nail-biting technical challenges are encountered and are solved.